Here's a sample of commerical vehicle design from my portfolio. Click here to see other automotive related projects I've designed. Below are some concept sketches that I did for a company (based Columbus, Ohio). They built custom mobile medical commercial vehicles by converting the interior of a 40ft. GMC moving van box. 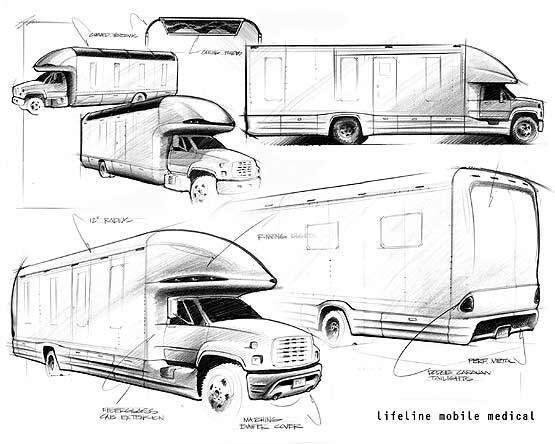 These sketches were created in 1998 when the company approached the firm I work for to do some concepts to dress up the exterior of their trucks. Although the company did high quality conversion work to the interiors they found that some potential customers were put off by the previous vehicle's humble beginnings as a commercial moving van. I did several concept boards showing various ideas for exterior dress up packages to give the commerical truck a more aerodynamic look using proprietary fiberglass pieces. The concepts were very well received by the client and helped the client win new customers.